This fella was done in fine-line pen in an A4 sketchbook. 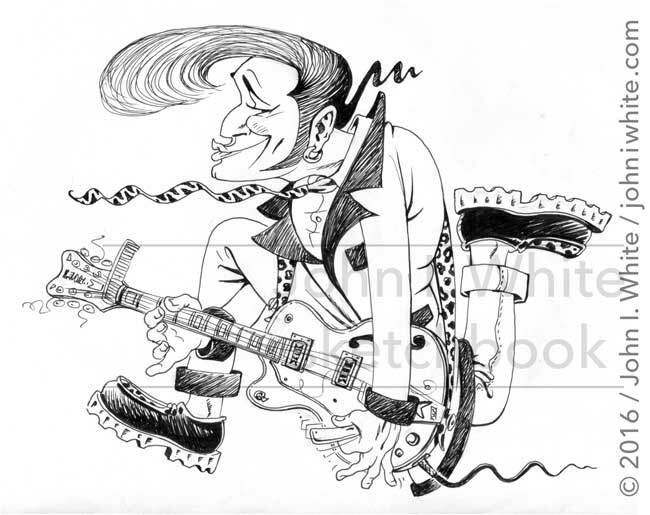 It was the first version of the one which would be used on the Album Artwork for an Irish Rock n’ Roll compilation music album. 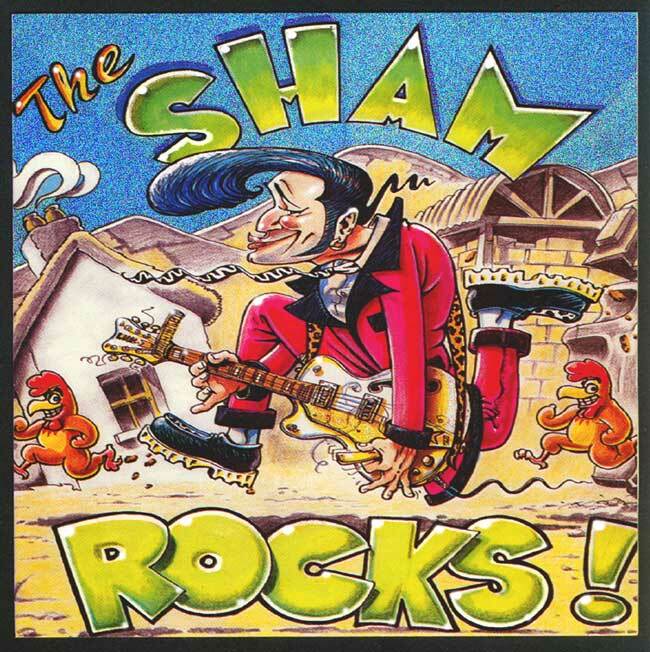 The Sham Rocks! 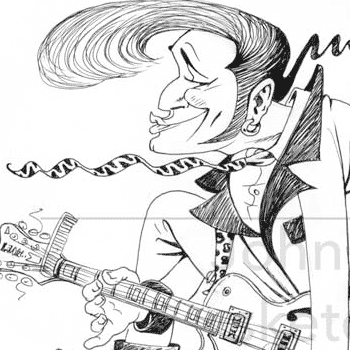 The Best of Rock n’ Roll in Ireland 1985–1995, from Stompin’ Records. Gavin Povey—the ‘Good Rockin’ Daddy’, of Stompin’ Records—briefed me that he needed a picture of a ‘Ted’ groovin’ in a farmyard with animals rockin’ along with him. I was immediately put in mind of those old old ‘Silly Symphony’ and ‘Merrie Melodies’ Disney cartoons, in which the whole landscape danced to the music. Dancing animals, trees, fences and buildings, and even the sun and clouds! I actually hand-drew a very Mickey Mouse style of lettering on the words SHAM ROCKS! It was terrific fun to draw, especially the teddy boy himself. I was going for a very contrived pose and gave him a strongly designed look. See the wavy hair, tie and guitar lead? And the—almost—stiffly vertical horizontal arrangement of the limbs and guitar. It was also fun to push the teddy boy look as far as possible, exaggerating the hair and clothes! 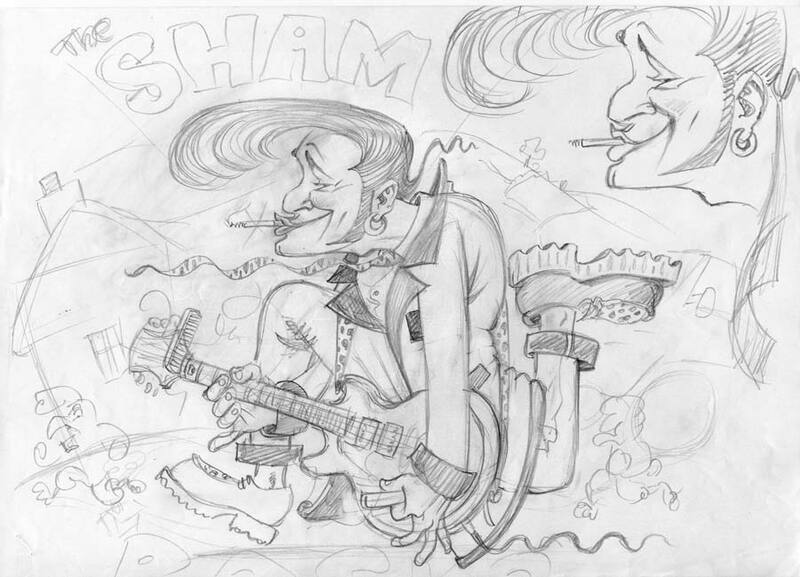 The pencil sketch below shows that I originally intended the Teddy Boy had a cigarette in his mouth. It just seemed right to me. ‘Cos, you know… smokin’ is coooool daddy-o.But Gavin preferred not to have the fag in it. I’m not sure why, maybe he was strongly anti-smoking? I wouldn’t blame him! He’s right. Smoking is absolutely disgusting. Nowadays I tend to only show unpleasant characters smoking. But, still, that cigarette does look cool—on him—and makes him much more of a poser! Unfortunately, I don’t have the final artwork in a quality file, but you’ll get an idea of what it looked like in the colour image below. But first, take a look at the initial pencil sketch, which I recently re-discovered. It looks like I did one sketch, then did a black line version of him, then went ahead with the finished art in full colour—all on paper. 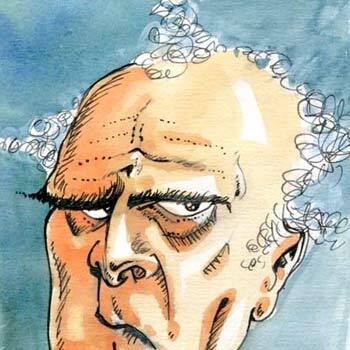 Above: the original pencil sketch. 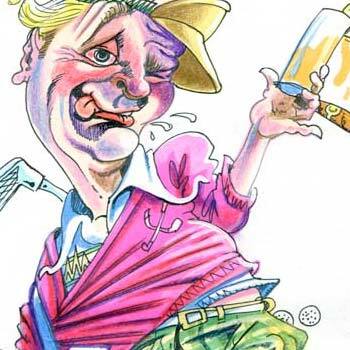 Note the original inclusion of the cigarette.